Ghummo Andaman For a Sea Walk..!!!! A first of its kind in India, Andaman & Nicobar Island host the ultimate experience of Sea Walk. 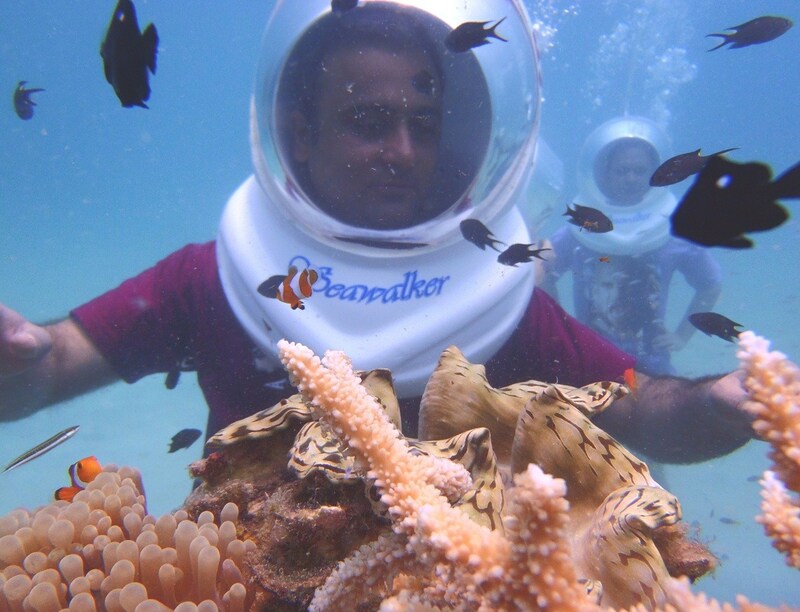 Though Andaman offers various adventure sports but Sea Walk has a separate joy to share..!!! It provides a absolutely fascinating option of exploring and enjoying the underwater world is through a fairly new, unique and uncomplicated sport called sea bed walking. North Bay(included in our package) a spot 20minutes away by ferry ride from Port Blair is a hub for this sea walk.The most unskilled of swimmers and even beginners can indulge in this delightful sport right from the very word “GO”. It is much easier when compared to scuba diving because you do not need to practice breathing through your mouth. Sea bed walking allows one to explore the brilliant marine flora and fauna off the Islands from extremely close quarters and more often than not, from within touching distance of fish, in their natural habitat. The Sea walk is experienced under the strict supervision and guidance of highly trained and internationally certified instructors who are with you throughout the entire experience. They ensure infallible and uncompromising safety while completely averting any difficult eventuality. The tour begins with a boat ride transferring you onto a pontoon which is anchored of the coast, measuring 1600sq ft with elaborate facilities such as changing rooms, lockers, wash rooms etc. At this point the guides brief the walkers on basic hand gestures, safety procedures and the actual steps to be taken during the sea walk. The vital part of the gear is a heavy framed glass helmet, very similar to that used by astronauts. This provides for an extensive all round viewing. An integrated hose pumps air into the helmet providing uninterrupted supply of fresh air to the seawalker.The air pressure prevents water from getting into the helmet. This ensures that the users face is not exposed to water when sea walking. Attached to the pontoon is a specially custom built stairway that will lead the walker underwater and on to the shallow sea bed. Once you land your feet on the sands of the sea bed, the experience is a sheer joy to behold, an amazingly new and enthralling one which people often compare with their imaginations of space walking. As per the prior guidance on the pontoon, the guides communicate with the walkers by a series of hand gestures like “left or right” ”ok” “no problem” etc. The guides walk you through the sea walking area which is cordoned off by nets. One gets to view and touch underwater life such as orange clownfish, sea anemones, star fish, shell fish, which essentially are slow moving creatures that cannot be experienced otherwise. The joy of having numerous brilliantly coloured tropical reef fish swim around you is magical indeed. You can feed the fish and indulge in underwater photography. These memories will relish forever. The walk finishes with your accessing the hand railings of the stairway to come out of the water and mount aboard onto the pontoon. It ultimately gives our guest a experience of lifetime..!!!! So come Sea Walk Port Blair with Ghummo Andaman…!!! !